KingCamp Camping Cot Double 2 Person Oversized Anodized Steel Frame Portable Folding Bed for 2 person is perfect to be used at park, beach, backyard, garden, camp site or other outdoor places! 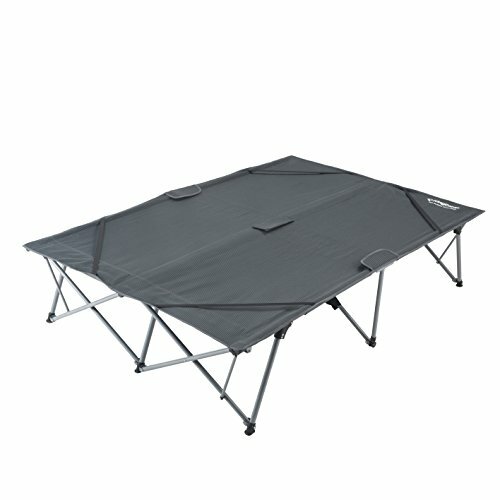 The camping cot only weight 13.1 lbs and the size only has 11.8x 11.4x 45.3 inches after folded which make it portable to be carried like a small luggage on a trip, fits in most car trunks. High strength steel tubes bracket and triangle structure design makes the bed firmly; at the same time fundamentally solve the problem of the structure stability. 1200D fabric can enhance the bearing capacity and support up to 550 lbs. No tools needed! With the folding design, the bed is easy to open or fold in seconds when you need to use it at anytime and help you save much time.